Oh, the funky things we find at garage sales. 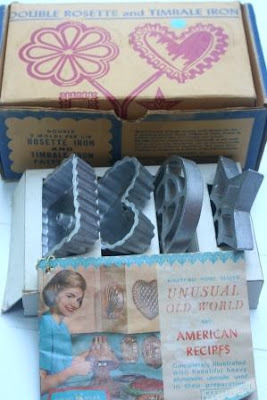 Vegan Mom picked up this rosette and timbale iron (circa the 1950s, I think) this weekend. To be honest, I have never seen such a thing and wasn't even sure what a rosette or timbale was, let alone how the iron aided in their creation. Luckily, the box included a handy book of "unusual old world and American recipes" that answered all my questions. Rosettes are a type of cookie, and timbales are pastry shells into which on could place a variety of things (the book's suggestion: creamed tuna. Um . . . no?). The method of making these things smacks of the 1950s, too. Heat iron in fat, dunk iron into batter, dunk iron back into fat and deep-fry until done. The batters rely heavily on eggs and condensed milk but I really want to use these things just for the fun of it. So, stay tuned. And, has anyone heard of these type of irons before?